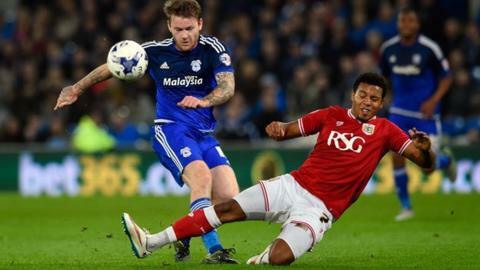 Cardiff City and Bristol City fought out a frustrating goalless draw as the Severnside derby failed to ignite. The visitors shaded a first half which ended with a spectacular save from Cardiff goalkeeper David Marshall to deny Jonathan Kodjia. A second half of scarce quality came to life late on, as Elliott Bennett hit the post for Bristol City and Cardiff's Sammy Ameobi shot wide from four yards. Cardiff are eighth in the Championship while Bristol City climb up to 20th. Although Cardiff had shown promise earlier in the season, dwindling crowds had tempered any optimism the team's early form may have generated. Their preceding 1-0 win against Middlesbrough was watched by the lowest league attendance of 13,371 since the Bluebirds moved to their new ground in 2009. But a derby match and an attendance of 15,287, boosted by a vociferous travelling contingent, lifted the Cardiff City Stadium atmosphere. Set up in a 5-3-2 formation to counter Cardiff's rigid 4-4-2, Bristol City looked to stretch the game at every opportunity. They did so effectively and a sixth-minute cross from Marlon Pack almost led to the opening goal but Aaron Wilbraham's header was well held by Marshall. Matt Connolly had Cardiff's best chance of the first half as he nodded wide from Peter Whittingham's corner, before Marshall was called into action again moments before the break. Bennett's inviting cross found the unmarked Kodjia, and the striker's firm header was tipped over by Cardiff's Scotland international keeper. Marshall was kept busy after the interval as Bristol City went close with a Luke Freeman shot from the edge of the area which was palmed away. Neither side played with much fluency as the match became disjointed, but there was a flurry of chances in the closing moments. Kodjia had a goal disallowed as he tapped in from an offside position, before a frantic exchange in the Cardiff box ended with Bennett blasting the ball into the post. The Bluebirds countered and could have snatched an unlikely win, but an unmarked Ameobi rushed his shot and missed the target from inside the six yard box at the front post. Cardiff City manager Russell Slade said: "We were below par in the first half, we didn't have a creative edge. "We are tight and organised, but we need to be doing more, particularly at home, to be creating more opportunities. "Sometimes in football you cannot always find the level you've set yourself, but there's no need for doom and gloom." Bristol City manager Steve Cotterill said: "I'm disappointed for the boys not disappointed in them, had that last chance gone in from Ameobi it would have been a catastrophe. "We did enough to win the game, some of our football was excellent and we had some great efforts on goal. "We've got a very young team, our boys are doing a lot of learning and the Championship is a tough learning curve for them, but they are coming through it with flying colours. "We've played like we did here all season, that was not a one-off. Things will turn around for us during the season and it will come back to us." Match ends, Cardiff City 0, Bristol City 0. Second Half ends, Cardiff City 0, Bristol City 0. Attempt missed. Anthony Pilkington (Cardiff City) left footed shot from very close range is close, but misses to the left. Assisted by Sammy Ameobi with a cross. Attempt missed. Jonathan Kodjia (Bristol City) left footed shot from the right side of the box is high and wide to the left. Assisted by Aaron Wilbraham with a headed pass. Attempt missed. Sammy Ameobi (Cardiff City) left footed shot from the right side of the six yard box is close, but misses to the right. Assisted by Joe Ralls with a cross. Elliott Bennett (Bristol City) hits the right post with a right footed shot from the right side of the box. Attempt blocked. Luke Freeman (Bristol City) header from the centre of the box is blocked. Attempt saved. Joe Bryan (Bristol City) left footed shot from the left side of the box is saved in the centre of the goal. Assisted by Derrick Williams with a through ball. Hand ball by Joe Mason (Cardiff City). Attempt saved. Marlon Pack (Bristol City) right footed shot from outside the box is saved in the centre of the goal. Assisted by Joe Bryan. Substitution, Cardiff City. Anthony Pilkington replaces Alex Revell. Offside, Bristol City. Joe Bryan tries a through ball, but Jonathan Kodjia is caught offside. Attempt saved. Joe Bryan (Bristol City) left footed shot from the centre of the box is saved in the centre of the goal. Assisted by Elliott Bennett with a cross. Corner, Cardiff City. Conceded by Frank Fielding. Attempt missed. Derrick Williams (Bristol City) right footed shot from outside the box is high and wide to the right. Assisted by Korey Smith. Joe Mason (Cardiff City) wins a free kick in the attacking half. Offside, Bristol City. Joe Bryan tries a through ball, but Aaron Wilbraham is caught offside. Corner, Bristol City. Conceded by Aron Gunnarsson. Corner, Cardiff City. Conceded by Luke Ayling. Corner, Bristol City. Conceded by Matthew Connolly. Attempt missed. Marlon Pack (Bristol City) right footed shot from the right side of the box misses to the left. Assisted by Elliott Bennett. Attempt missed. Marlon Pack (Bristol City) header from the centre of the box is too high. Assisted by Luke Freeman with a cross following a corner. Corner, Bristol City. Conceded by Lee Peltier. Attempt blocked. Joe Bryan (Bristol City) header from the centre of the box is blocked. Assisted by Luke Ayling with a cross. Attempt saved. Luke Freeman (Bristol City) left footed shot from outside the box is saved in the centre of the goal. Assisted by Marlon Pack.